Casa Julia is a beautiful rustic style bungalow, in a peaceful small rural development of similar styled properties, in the heart of the Rosal wine producing area. It has a compact well maintained, secure garden, with a single depth private pool. Its large shady terrace has views of the garden, pool, vineyards and distant hills, with good quality terrace furniture, BBQ and loungers being available to guests. The pretty, large village of O Rosal is close by, and has all the shopping facilities required for a self catering family. Lovely estuary and Atlantic sandy beaches are 10 minutes drive, as is the working fishing port of La Guardia, where numerous sea food restaurants abound. The lofty Monte Tecla is visible from Casa Julia, which has fantastic views down the Portuguese and Galician coasts, and is steeped in Celtic and Roman history. Indeed, Portugal is only 15 minutes drive away across the Rio Minho, which can be crossed by ferry or bridge. A whole new country to explore. A large well equipped bathroom is situated between the twin bedrooms. A second shower room with toilet and wash hand basin is also available to guests. The main living room is extremely attractive and comfortable, with beamed ceiling, ample comfortable sofas and chairs. A double patio door opens directly to the large covered terrace, and enjoys the same lovely views with the setting sun in the evening. The large, attractive and well equipped kitchen/diner has cooker, hob, microwave and dishwasher available. Lovely well stocked garden with shrubs and fruit trees. 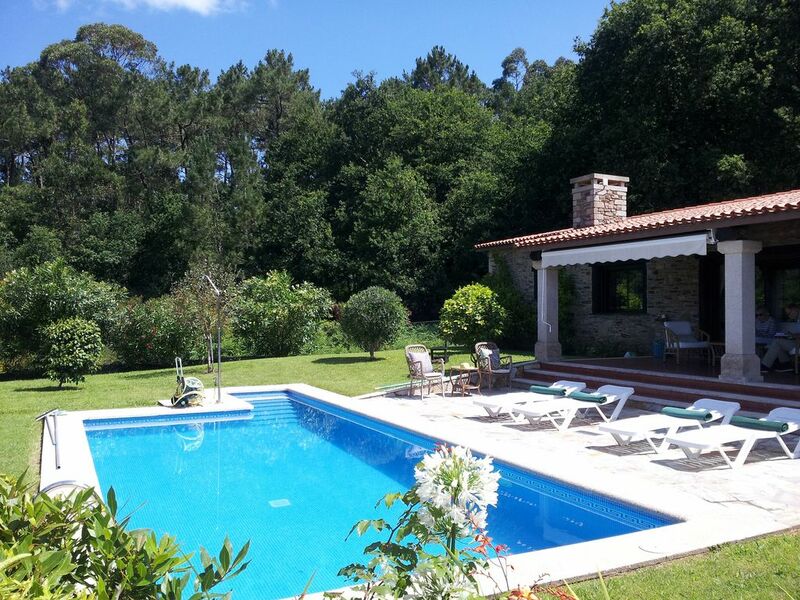 A large well furnished covered terrace with a view of pool, garden, vineyards and hills. There are four golf courses within one hours drive. Vigo 9 holes is 40 minutes away. Notes on accommodation: The bungalow is a much loved holiday home of the owners, with good quality furniture and personal items which are left there for the guests enjoyment. Families, with respect for this aspect are welcome, and will enjoy to the full, the ambiance and warmth that this trusting attitude instills. Outside: The garden is well secured with walls, fences and gates, for the safety of children. The rural road finishes at the property so traffic risk is not a problem. The private good sized swimming pool is directly accessible from the garden and terrace, and therefore caution and due diligence is required where small children are involved. Utility Room: The utility room has a washing machine available to guests. Cleaning / Towels / Linen / Maid service: All linen and towels are provided, as are covers for the pool loungers. A change of towels and bed linen is available when reasonably required. A maid service can be provided if required at extra cost. Other: The Large attractive covered terrace needs a special mention, as the perfect place to spend those balmy evenings looking at the garden, pool, views and setting sun. Comfortable terrace table and chairs are provided. Accueil chaleureux de Robin et Broc ( chien très humain!) avec un suivi de notre sejour ( descriptif pour les visites, lieux de restauration etc....). Seul bémol! Les propriétaires de la maison jouxtant celle-ci peu sympathiques avec un petit chien ( roquet) toujours aux abois! Une belle expérience néanmoins! Nous étions deux mais maison idéale pour une famille ou deux couples ( deux salles de bain). Au plaisir de refaire une halte dans cette belle région riche en culture et gastronomie! The property is a home away from home with everything you need. The pool was great to keep our young children occupied, we did wine tasting and pipped over to Portugal for a day and visited the local area. We would keep this property in mind for future holidays and Robin was very helpful. Four lovely sandy estuary and Atlantic beaches are within ten minutes drive, with rockpools adjacent to the main beach at the spectacular Playa O Muino. Numerous other sandy and pine clad beaches are within 30 minutes drive on both the Spanish and Portuguese side of the Rio Minho. Surfing beaches are numerous in the area with schools and equipment hire available. Porto is the most convenient airport (one hours drive) with Ryanair flying from many bases, including Stansted, Bristol, Birminham and Liverpool.. Santiago de Compestela is a similar distance but takes rather longer. Clickair now run a twice weekly flight to Vigo from Gatwick.Bilbao and Santander ferry ports are about 6 - 8 hours drive through lovely countryside. We recommend car hire to get the best out of this lovely area, pickups are available from airports. Ask for details of cheap deals. O Rosal 15 mins walk - 3 mins drive. La Guarda - fishing harbour, 10 minutes drive. Celtic Village. 10 minutes drive. Tui and Valenca, Historic towns - 20 mins drive. Santiago de Compostela 1.5 hours drive. Porto city 1.5 hours drive. Surfing, canoeing, white water rafting, sailing, horse riding and hiking facilities are all available in the area. Just ask for details. Many good restaurants locally, Supermarket 3 -5 mins drive. The bungalow is in the middle of the celebrated Rosal an Albarino wine producing area, with numerous vineyards and bodegas. The Port and wine producing areas of Porto and Douro are within 1.5 hours drive. Booking Notes: On confirmation of booking a 33.3 % deposit is to be paid with balance on arrival. Changeover Day: Changeover day flexible. Notes on prices: Prices are for the property per night in euros. Minimum of 6 nights in peak months, but please ask at other times. Couples requiring only one bedroom ask for reduced rate. Stays of longer than 7 nights October to March qualify for 10 euros per night reduction.